The RIDGID HyperDrive 18-Gauge 18-Volt Brushless 2-1/8 in. Brad Nailer is taking pneumatics to the next level. Using the industry leading feature set of Fasten Edge Technology RIDGID HyperDrive offers you all the power of a pneumatic nailer in a cordless tool. With no compressor, no hose and no gas cartridge, this 18-gauge brad nailer provides a faster setup and easier manoeuvring on the job site. The RIDGID HyperDrive Brad Nailer Drives 18-gauge nails from 5/8 in. to 2-1/8 in. This tool is backed by the RIDGID Lifetime Service Agreement providing free seals, free pistons, and free driver blades, for life. Accepts 18ga brad nails from 5/8" - 2-1/8"
The M18 FUEL 18ga Brad Nailer delivers on the promise of peak productivity at your worksite, providing unmatched driving power, speed and efficiency with practically no set up and minimal maintenance. Using the exceptional application speed, power and durability of our compact POWERSTATE Brushless Motor, plus our ready to fire cylinder design, this tool is capable of fully sinking 2 brads into solid oak with zero ramp-up time. This 18-volt nailer operates from the revolutionary REDLITHIUM Battery for unbeatable strength and run-time, eliminating the mess and cost of gas cartridges. It also includes REDLINK PLUS Intelligence, the most advanced electronic system on the market, to prevent damage to the nailer and battery from overloading and overheating. The M18 FUEL Nailer not only primes you for top performance; it also creates the experience of a pneumatic nailer that professional carpenters and remodelers expect, without the hassle of compressors and hoses. HYPERDRIVE 18V 18-Gauge 2-1/8 inch Brushless Cordless Brad Nailer The RIDGID HyperDrive 18-Gauge 18-Volt Brushless 2-1/8 in. Brad Nailer is taking pneumatics to the next level. 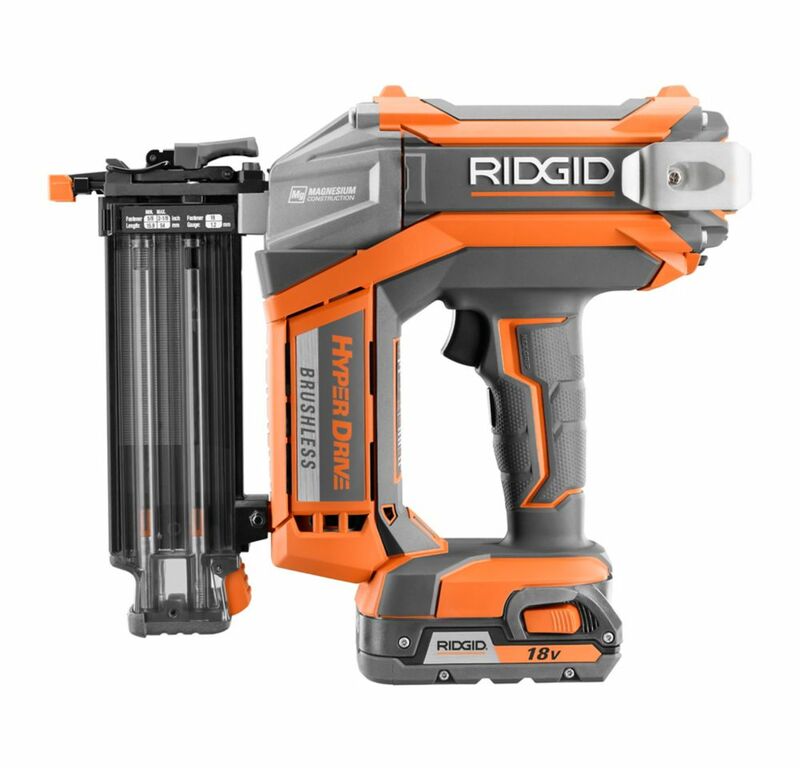 Using the industry leading feature set of Fasten Edge Technology RIDGID HyperDrive offers you all the power of a pneumatic nailer in a cordless tool. With no compressor, no hose and no gas cartridge, this 18-gauge brad nailer provides a faster setup and easier manoeuvring on the job site. The RIDGID HyperDrive Brad Nailer Drives 18-gauge nails from 5/8 in. to 2-1/8 in. This tool is backed by the RIDGID Lifetime Service Agreement providing free seals, free pistons, and free driver blades, for life. HYPERDRIVE 18V 18-Gauge 2-1/8 inch Brushless Cordless Brad Nailer is rated 4.3 out of 5 by 72. Rated 3 out of 5 by Jacob from I purchased this Ridgid over the Milwaukee equivalent because of... I purchased this Ridgid over the Milwaukee equivalent because of the reviews - the Milwaukee supposedly has issues with the brads counter-setting. That said, I had the same issue with the Ridgid. I think the issue might be that I was working in below-freezing temperatures, because when the unit was warm it worked as expected. That said, it's frustrating needing to counter-set every other brad when it's cold out. I do like the ease-of-use, battery life, LED light, and case it came with. I wish the case was more compartmentalized to store the unit, battery charger, and various brads securely with it instead of just loose in the case. That said, it does hold everything, and I bought a plastic container to hold different brads. Rated 3 out of 5 by handson1 from I like the fact I no longer have to haul... I like the fact I no longer have to haul the compressor and hose around, but still need to for pin nailing trim. I dont like the fact that i cant get it close enough into the inside corners of my mitres. Rated 5 out of 5 by HomeDepotCustomer from This tool is great. It feels well balanced. Has lots... This tool is great. It feels well balanced. Has lots of power. Did not jamb up either like some nail guns I have tried. So handy with no compressor cord to drags around. Rated 3 out of 5 by Highflyer701 from Looks nice, balanced nice, has an imbedded light. Only bad thing is the recharge/charge up time ... Looks nice, balanced nice, has an imbedded light. Only bad thing is the recharge/charge up time until the nail goes in..too long of a delay. Guess I'm use to the pneumatic nailers. Good for the DIY, Poor for someone that has to make money with it. Rated 5 out of 5 by Longsofty from Great tool, no misfires. A little heavy but better than... Great tool, no misfires. A little heavy but better than dragging a hose. Rated 5 out of 5 by Stephen from Awesome!... Awesome! Rated 5 out of 5 by Pappy from As I have found with other RIGID tools this is a solid quality tool. Its slightly heavy but well ... As I have found with other RIGID tools this is a solid quality tool. Its slightly heavy but well balanced.